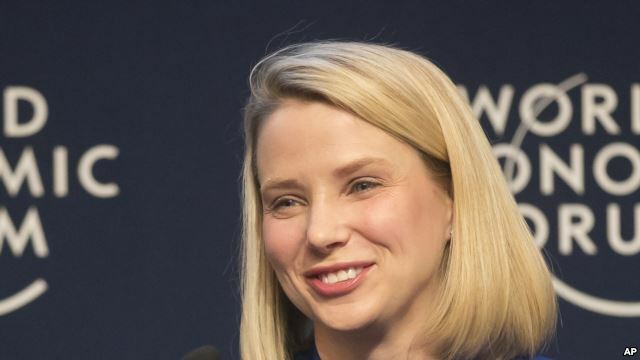 Yahoo CEO Marissa Mayer says she's pregnant with identical twins. Mayer says on a posting on her blog that she and her husband are expecting the twin girls in December. "I have some exciting news to share - I'm pregnant!'' she says on her Tumblr posting Monday night. Mayer says that she will take some limited time away but work during the pregnancy as she did with her son's birth three years ago. She says that she's informed Yahoo executives of her pregnancy. Three years ago, Mayer announced she was pregnant with her son on her social networking accounts just a few hours after Yahoo hired her as its third full-time CEO in less than a year. 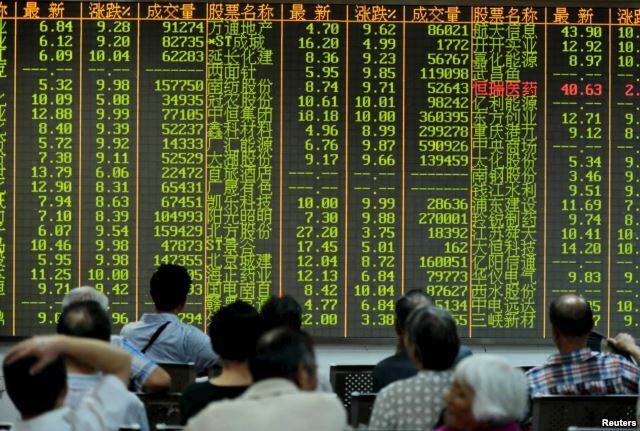 Volatility in China’s stock market on Tuesday and the release of manufacturing data is raising more concerns about the outlook for the Chinese economy, even as officials here insist the situation is under control. 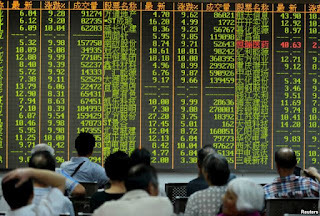 Stock prices on the country’s main index in Shanghai plunged almost 5 percent shortly after opening on Tuesday. A rocky round of trading followed, before the market closed down 1.2 percent. Analysts said the release of more bad economic data weighed on shares. According to an official survey of factory activity, China’s manufacturing sector contracted at its fastest pace in three years. A survey by Markit, which focuses on smaller private firms, showed activity at factories at the weakest performance level in six and a half years. China is not the only country in Asia that is seeing slower manufacturing activity, but it is the world’s second largest economy. And as its struggles to ween away from an over-reliance on exports and push forward with long overdue reforms, it is having a ripple effect on the global economy, shaking up global markets and commodity prices. The developments have been so significant, that Japan’s finance minister Taro Aso suggested on Tuesday that the Chinese economy be a focus of this week’s meeting of the Group of 20 major economies. Aso said that instead of being swayed by superficial market moves, he believes it’s important to understand the structural issues behind what is going on in China. “I think it’s beneficial to hold a frank debate at G20 on what is happening in the Chinese economy,” he said. During a visit to Indonesia on Tuesday, International Monetary Fund Director Christine Lagarde urged emerging economies to be vigilant for spillovers from China’s slowdown. Lagarde said that while China’s slowdown was not sharp or unexpected, it is adjusting to a new growth model. "The transition to a more market-based economy and the unwinding of risks built up in recent years is complex and could well be somewhat bumpy," she said. An official at China’s National Development and Reform Commission, the country’s top economic planning agency, assured Tuesday that the stock market volatility was contained and that the country could withstand as it pushes forward with market reforms. China has unleashed a flood of measures to defend the index, but despite that effort, the market has continued to fall. China’s main index in Shanghai is down about 40 percent since mid-June. For many who watch the market, it is hard to tell just how low the index could go. "For now, no one can say for sure if the markets have hit rock bottom," said Lu Suiqi, an associate professor of economics at Peking University. New measures announced by the government on Tuesday, including policies to support mergers and acquisitions, cash dividends and share buy-backs by listed state-owned companies did little to boost sentiment. Critics add that such reforms are a dead end when it comes to the long-term health of the Chinese economy. "If [policy-makers in] China continue the mindset of making state-owned enterprises bigger and stronger, such state-owned enterprises will still be short of efficiency and a fair play,” said Hu Xingdou, an economics professor at Beijing University of Technology. What is more important is to attract more private investment and encourage the privatization of state-owned enterprises, he said. Hu said efforts to prop up the market, particularly in the run-up to this week’s massive military parade in Beijing, can only fuel unrealistic expectations among investors for a government bailout. It also violates free market mechanisms, he said. "Between the government [intervention] and the market [reform], China on the one hand allows market [forces] to prevail, but on the other hand, it has overdone it when it comes to intervention," Hu said. 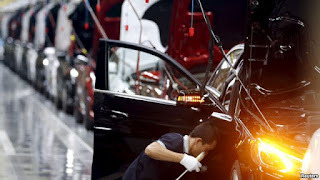 Liao Qun, chief economist at China CITIC Bank says that while the Chinese economy is doing poor in manufacturing, services continue to do better than anticipated. He believes it will still take some time for the economy to rebound. “In the short term, the government still needs to expand its pace of monetary easing and the use of fiscal stimulus to help stabilize demand,” Liao said. The turmoil in China’s stock market and devaluation of its currency has led economists at Goldman Sachs to slash their forecasts for China for the next three years, saying that by 2018 China’s economic growth is expected to slow to 5.8 percent. Goldman Sachs expects growth of 6.4 percent and 6.1 percent for China in 2016 and 2017. According to Reuters news agency, economists at ANZ are also rethinking their forecasts. Economists said that based on the manufacturing data released Tuesday, they expect China’s economy to grow by 6.4 percent in the third quarter but to rebound with policy support to 6.8 percent in the fourth and last quarter of the year. Global economic growth is likely to be weaker than earlier expected, the head of the International Monetary Fund said on Tuesday, due to a slower recovery in advanced economies and a further slowdown in emerging nations. 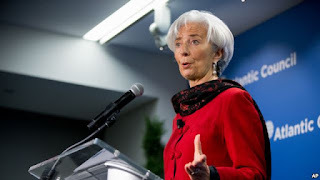 IMF Managing Director Christine Lagarde also warned emerging economies like Indonesia to "be vigilant for spillovers" from China's slowdown, tighter global financial conditions, and the prospects of a U.S. interest rate hike. "Overall, we expect global growth to remain moderate and likely weaker than we anticipated last July," Lagarde told university students at the start of a two-day visit to Indonesia's capital. The IMF in July forecast global growth at 3.3 percent this year, slightly below last year's 3.4 percent. Lagarde said China's economy was slowing, although not sharply or unexpectedly, as it adjusts to a new growth model. "That said, the authorities have the policy tools and financial buffers to manage this transition." 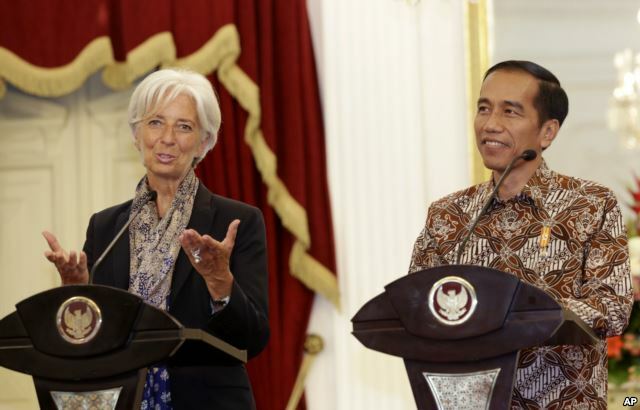 Lagarde, who is visiting Indonesia for the first time in three years, said Southeast Asia's largest economy had the "right tools to actually react" to the global volatility. "You have very sound public finances with overall government debt in the range of twenty-ish percent relative to GDP, you have a relatively small deficit," she said before meeting with Indonesian President Joko Widodo.